So tuna. 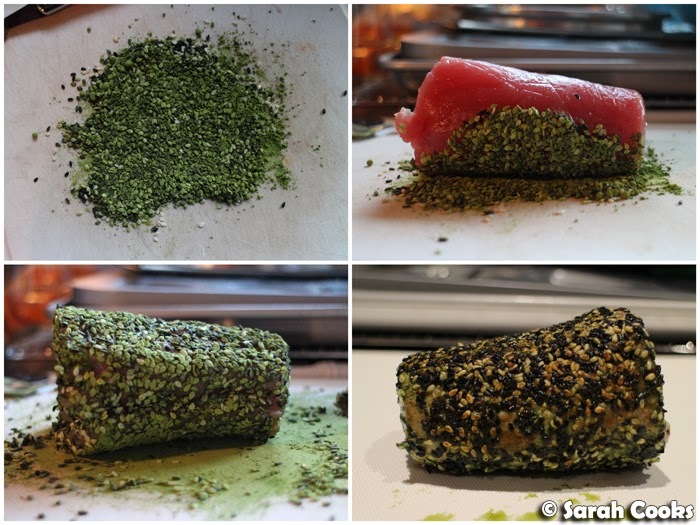 I saw a nice piece of tuna at the local fishmonger, and thought I'd do something with it that I'd seen on Jamie's 15 Minute Meals - coating the tuna in green tea, black and white sesame seeds and searing the outside to a nice crust. Jamie used the inside of a green tea bag; I used that Kenko matcha powder that I was given as a sample. 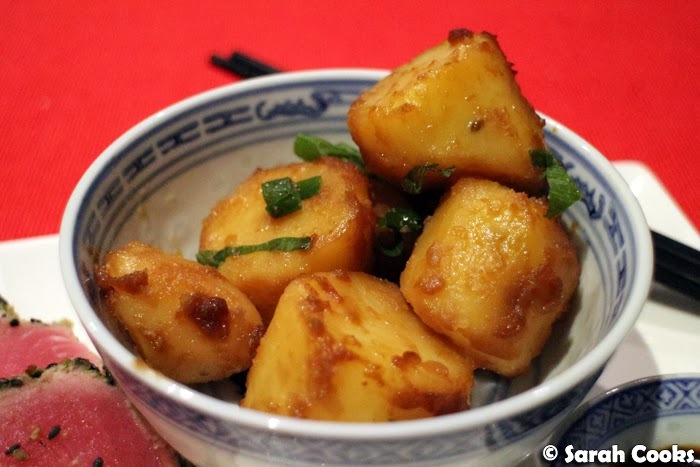 As an accompaniment, I tried a recipe from Bill Granger's Everyday Asian - boiled potato pieces cooked in a mixture of soy sauce, butter and sugar, and served with chopped spring onions. It's a contemporary, unique idea, and as soon as you sprinkle the spring onions over it smells so Japanese. Love it! 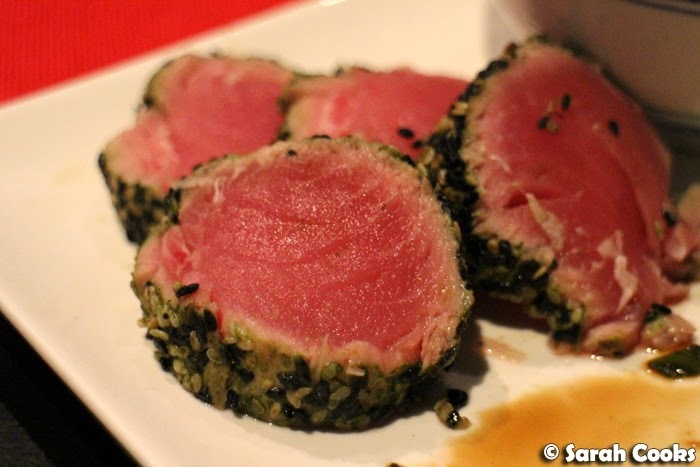 The matcha and sesame seeds give a gentle bitter toastiness to the tuna, without overpowering the delicately flavoured fish. It's a great combination. 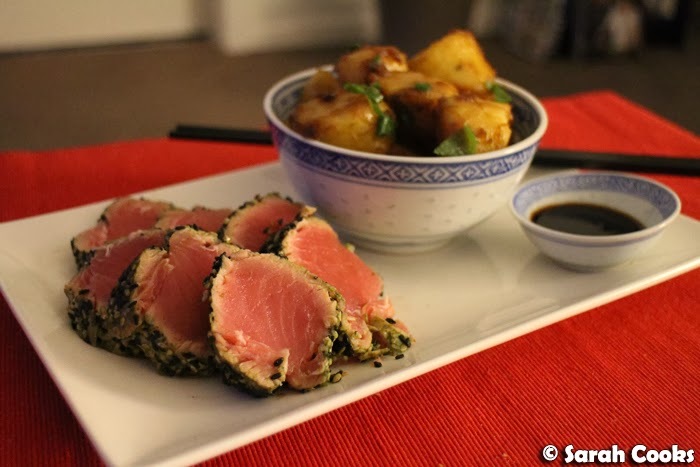 I love tuna, I love potatoes, I love Japanese flavours. Winner winner tuna dinner! 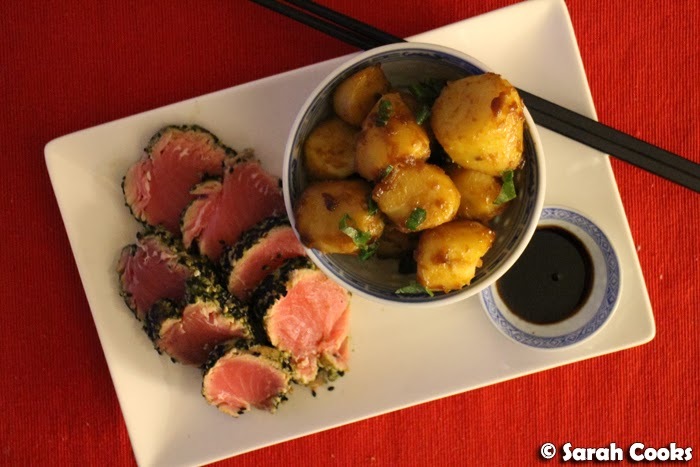 Place the sesame seeds and matcha powder on a chopping board and mix to combine evenly. 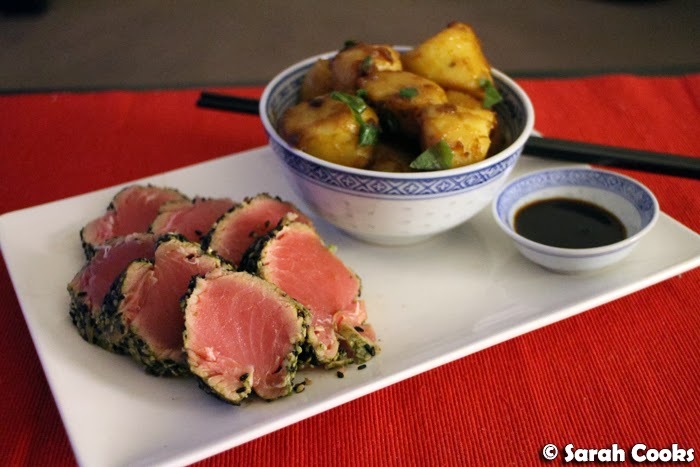 Roll the tuna fillet in the mixture until all sides of the tuna are coated. Heat the olive oil in a non-stick pan over high heat, then cook the tuna for forty seconds a side, until seared on the outside and still raw in the middle. Set aside on a clean chopping board to rest for a few minutes. Slice into one-centimetre slices and arrange on a serving plate. 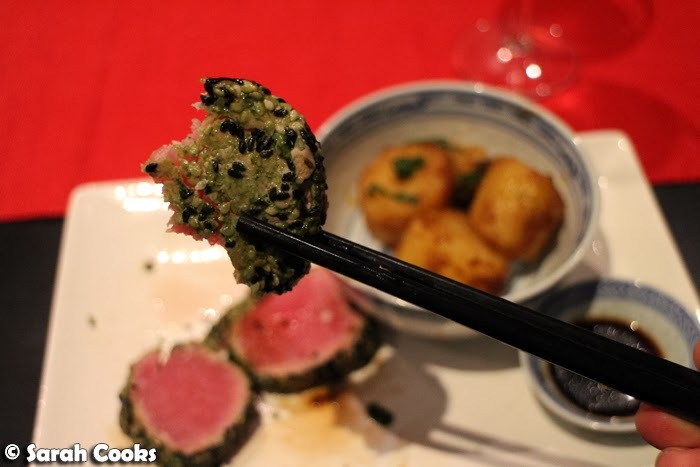 Serve with soy sauce for dipping. Peel the potatoes and cut into irregular chunks. Boil the potato in salted boiling water for approximately 10 minutes or until tender. Drain. 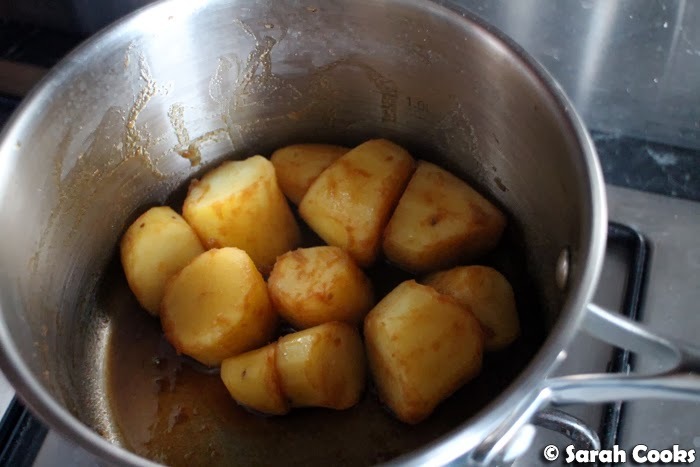 Place the potatoes back in the hot and dry saucepan, followed by the butter, soy sauce and caster sugar. Cook over a medium heat for 5 minutes, stirring occasionally until the liquid has mostly been absorbed by the potatoes. Sprinkle with spring onion greens to serve. Ooh the tuna looks good! The potatoes remind me of something my mum makes, though without butter. I can imagine the deliciousness! Yeah you always make everything that is The Good in my heart. Such a simple dinner, but I bet it was tasty.